Craftsman taking a break from making wicker chairs in a village near Muang Ngoy. My first stop in Laos was Luang Prabang, which I arrived at by way of a grueling, jam-packed 28-hour bus ride from Hanoi. A a sine qua non for first-time visitors to Laos, this UNESCO designated town situated alongside the Mekong River is the darling of Lao’s tourism industry. One of the most refined places in Indochina, the people of Luang Prabang have no reservation embracing the architecture and cuisine of its French colonizers. Thrown into the mix are more than 33 Buddhist temples and the grand Royal Palace, which served as the seat of the monarchy in Laos until the communist revolution in 1975. Every morning at dawn, monks shuffle single-file through the streets to receive food from the townspeople in an alms-giving ceremony that is both sacred and ancient. Unfortunately, this age-old ritual has become fraught with controversy as tourists simply can’t behave respectfully towards the monks. Despite signs posted all over town and in hotels listing various “do’s and dont’s” for those wishing to see the monks receive alms, people fail to observe even the most basic common sense, wearing inappropriate clothing or failing to keep a respectful from the monks. Making the problem worse are the opportunistic hotel and tourist agencies offering sightseeing packages for the affair, further emboldening tourists to feel justified in getting ultra close. Some temples and monasteries have push-backed, telling city officials that their monks would stop participating in the ritual if things did not improve. In turn the city responded that they would hire actors to replace the monks, leaving the holy men with no recourse to receive charitable contributions with dignity. Young monk taking a break from gardening at Wat Mahathat in Luang Prabang. Tourists have become a real annoyance for the monks in Luang Prabang. From Luang Prabang I headed north to the villages of Nong Khiaw and Muang Ngoy. I only spent a couple days in Nong Khiaw, which is quite an established playground for backpackers, complete with cafes, bars, and outfits advertising trekking and canoeing tours. Finding Nong Khiaw too touristy, I hopped on a ferry to take me to Muang Ngoy, which is only accessible by the Ou River. As soon as I got there, I immediately succumbed to the charm of the lazy little village embedded in karst landscape. While Muang Ngoy is by no means off the beaten track, there are other villages in hiking distance that provide a more authentic experience of “real” Laos. Every evening group fitness sessions are held on Vientiane's riverside promenade. The last place I visited in Laos was its capital, Vientiane, which has to be the most laid-back capital city I’ve ever visited. The capacious boulevards and other French-colonial attributes of Vientiane’s charming old-quarter provide a backdrop of decaying elegance for the cafes, bars, street vendors, and boutique hotels. In the evening, locals head to the riverside promenade to partake in a group aerobic session or social at the night market. One of the most moving attractions in Laos is the SCOPE Visitor Center located just outside the city center. This nonprofit supports the victims of unexploded ordinances leftover from the Laotian Civil War. During the war, which lasted from after the French were ousted in 1950 until the communist Pathet Lao took control in 1975, Laos was essentially a covert theater for the belligerents of the Vietnam war. In what would eventually become known as the Secret War, the CIA ramped up efforts to assist anti-Communist forces in Laos after it became known that the North Vietnamese Army failed to remove 7000 troops from Laos, in violation of a 1962 agreement between the US and North Vietnamese. What began as a covert operation by the CIA to train and provide arm to anti-communist Laotian fighters—primarily members of the White Hmong ethnic minority—culminated to the heaviest bombardment in history. The US dropped more bombs on Laos, a tiny country, than it did on Germany and Japan combined during World War II. During the Secret War, US bombers carried out on average a sortie every 8 minutes, 24 hours a day, for 9 years. An estimated 80 million out the 270 million cluster bombs dropped by the US campaign did not explode. Since the war, 20,000 Laotians, many of them children, have been killed or maimed by unexploded ordinance. I must admit that I did not find any aspect of Laos’ cultural or natural assets particular unique or exciting compared with my experiences in other countries in Southeast Asia. However, since opening its doors to Western travelers in 1988, the tourism has become Laos’ fasted growing industry, with many Laotians trying to tap into the new opportunities that come with this growth. As a result, prices for tourists are exceedingly high relative to other countries with similar economies as Laotians will try charge you whatever price they think they can get away with. This made traveling in Laos frustrating as it was hard to engage with locals past their opportunistic stance towards you as a potential money-tree. Still, the country has an understated natural beauty and its people—even those trying to make money off you—are generally very laid back. The exquisite Kuang Si Falls, 30 km from Luang Prabang. The Asiatic Black Bears Rescue Center shelters bears rescued from poachers. A party tuk-tuk in Xieng Men, a village opposite the Mekong River from Luang Prabang. Villager inside his abode in the outskirts of Muang Ngoy. 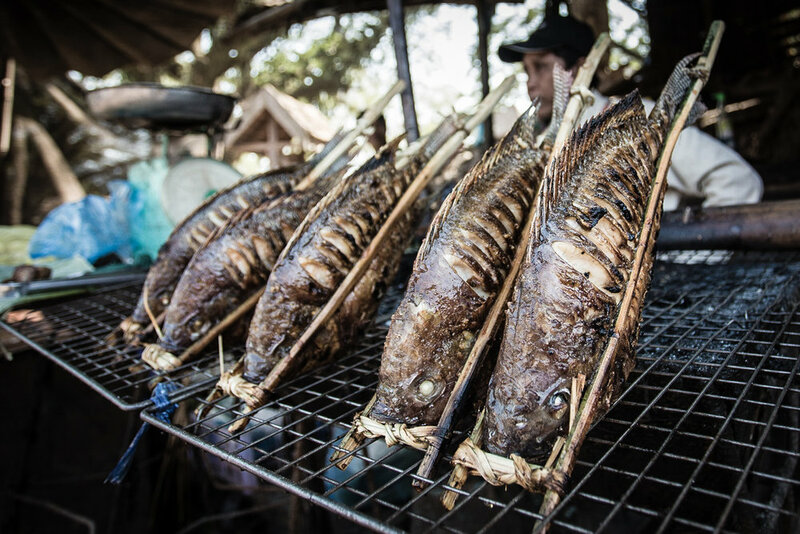 The catch of the day sold as street food in Laos. These funnel-web spiders are common throughout Laos. After 4 P.M. the local men of Muang Ngoy are more concerned with drinking beer over rounds of pétanque (a form of a form of boules) than making money of the tourists. Traditional weaving with manual loom. COPE Visitor Center. This statue, made from scraps of exploded ordinances, memorializes the victims of unexploded ordinances..